rolled to a 5-2 victory at the Cornerstone Community Center. Last nights game marked the first time St. Norbert (7-0) faced one of the five WIAC schools since they departed from the NCHA to form their own conference after last season. The Green Knights will take on another of those teams, UW-Stout tonight. The Knights went 1-3-1 against the defending NCAA champion Blugolds last season. After a scoreless first period, the Green Knights scored 4-goals in the second to take a 4-1 lead and never look back. It was an early season matchup, but it’s one the Green Knights will draw from as they measure where they are in the early going. The loss was the first of the season for the Blugolds. The Blugolds now get a rematch against St. Norbert College in the NCAA Quarterfinals on Saturday night at the Cornerstone Community Center in DePere. The Knights blanked Eau Claire 3-0 last weekend in Eau Claire to claim the NCHA Peters Cup Championship. The winner this weekend will advance to the NCAA Division 3 Frozen Four in Lake Placid. The St. Norbert College Green Knights continued their winning ways Saturday night with a 6-3 win against St. Olaf College. The Green Knights (12-2-1), coming off an offensive record-setting 12-2 win against St. Mary’s Friday night, made the most of a major checking-from-behind penalty in the second period, scoring twice during the five minute penalty. Before that penalty, St. Olaf jumped out to a 1-0 lead in the first period with a goal through Kevin Harris at the 10:42 mark. St. Norbert was held at bay for the rest of the period, with St. Olaf holding a one goal advantage as they started the second period. Cullen Bradshaw, who scored four goals last night, equalized for St. Norbert at the 1:09 mark in the second period, and Kyle Stroh scored again at the 2:32 mark to make the game 2-1. The Green Knights scored twice during the major penalty, with Chris Rial scoring at 8:29 and Cody Keefer scoring at the 8:48 mark to make the game 4-1. Mason Baptista lit the lamp for St. Norbert at the 12:37 mark to give the Green Knights a commanding 5-1 lead at the end of the second period. 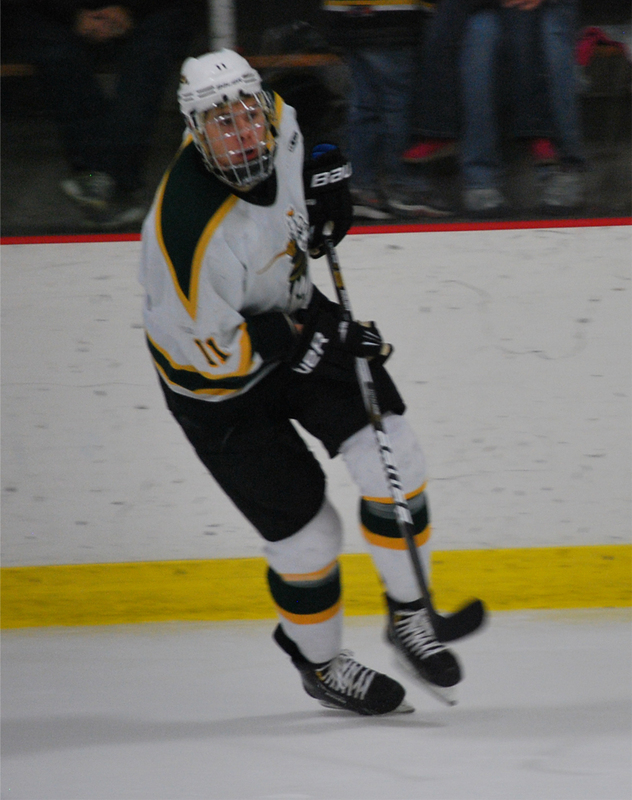 34 seconds into the third period, Bradshaw got his second goal of the night, scoring the sixth and final goal for the Green Knights. St. Olaf scored twice at the 2:48 mark through Harris, and again at the 7:39 mark through Joel Lundstrom. St. Olaf’s Henrik Wood made 24 saves in the loss, while St. Norbert’s David Jacobson made 17 saves in the victory. The Green Knight’s next test comes on the road against 11th ranked UW-Superior next weekend. St. Norbert College men’s hockey played their first game since the December 7 break, and picked up where they left off with a 12-2 win over St. Mary’s University. The fifth ranked St. Norbert College Green Knights (11-2-1) outshot the St. Mary’s University Cardinals 37-24, scoring one goal almost every three shots. The game took awhile to explode, with the first period only seeing one lone goal from the Green Knights. Cullen Bradshaw lit the lamp at the 10:51 mark, giving St. Norbert the lead 1-0. St. Mary’s tied the game up 11 seconds into the second period, with a goal from Mike Hill. For the rest of the period, St. Norbert dominated scoring seven times. 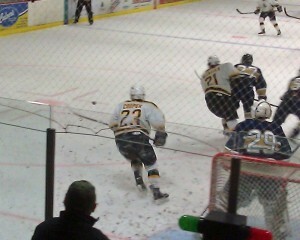 Cody Keefer scored his first of two goals at the 1:41 mark, making the game 2-1. Joe Perry scored again at the 5:07 mark. Bradshaw scored four minutes later to make the game 3-1, with Mason Baptista making it 4-1 at the 15:33 mark. Erik Cooper scored on a powerplay at the 16:44 mark, and Bradshaw got his hat-trick at the 18:18 mark to make the game 6-1. Patrick McCadden hit one last goal, in the second period, at the 19:39 mark to make the game 8-1. The third period saw a similar scoring pattern when compared to the second period. St. Mary’s scored first, at the 3:39 mark through Mike Hill, bringing the game to 8-2. Kyle Stroh added to the Green Knight goal tally at the 12:03 mark, and Bradshaw scored his fourth goal at the 13:29 mark to make the game 10-2. Patrick McCadden and Cody Keefer scored their second goals of the game at the 14:10 and 19:57 marks, respectively, to end the game 12-2. This offensive overload from St. Norbert is the best winning margin in over a decade. It also marks the first time they have scored double-digits since 2005. The Green Knights next take on the St. Olaf Oles at home, this Saturday night. The St. Norbert College Green Knights (8-2-1) and College of St. Scholastica Saints (3-5-0) stacked on Friday’s success and won their respective games Saturday in the MCHA/NCHA Thanksgiving Tournament. The Green Knights beat the Lawrence University Vikings 6-3 in a physical game. St. Norbert finished the first period with a lead of 4-1. Tyler Zepeda opened the scoring at the 1:18 mark with teammate Cody Keefer scoring only 16 seconds later at the 1:34 mark to make it 2-0. Kyle Stroh scored the first of his three goals at the 9:52 mark, and Carl Ekstrom scored at the 14:21 mark. Lawrence’s Steve Hughes put the Vikings on the scoreboard at the 11:10 mark. 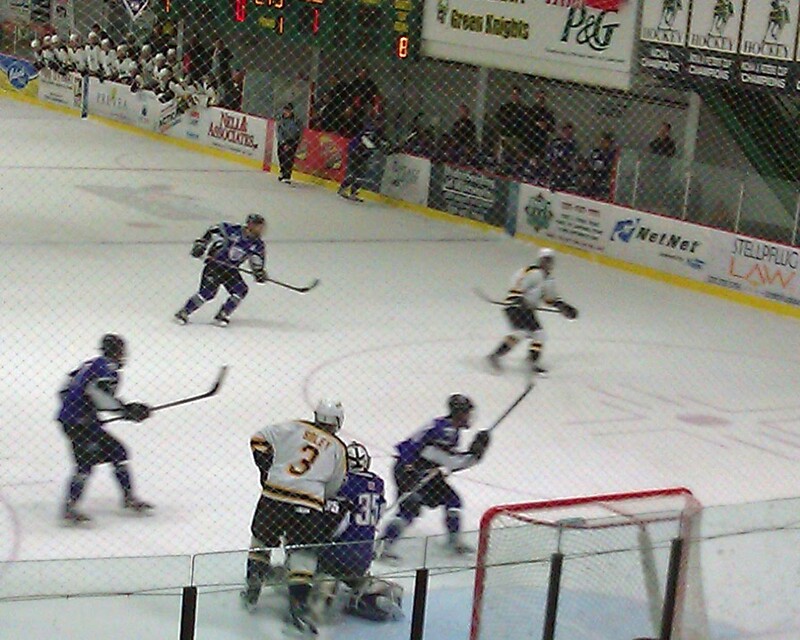 The second period saw St. Norbert’s Kyle Stroh score his second at the 7:35 mark to make the game 5-1. Lawrence scored two goals in the third period from Renato Engler, at the 15:04 mark, and Derek Brickan, at the 15:50 mark, to give the Vikings life and make the game 5-3. St. Norbert put the nail in the coffin with Stroh’s third goal of the game at the 16:33 mark to make the game 6-3. Green Knight Travis Bosch had 24 saves in the win, while Viking Anton Olsson had 31 saves. The St. Scholastica Saints rallied from behind and scored two third period goals to take down the Marian University Sabres 2-1. The first period saw a total of 16 shots on goal for both teams, and Matt Berger of Marian University finally broke through with a goal at the 10:17 mark in the second period. The Saints tied the game up when Brandon Nowakowski scored in the third period at the 3:37 mark. With a little under four minutes to go, Brandon scored his second goal of the game to win it for St. Scholastica. St. Scholastica’s Colin Rundell had 32 saves in the win, while Marian’s Randy Willis had 35 saves. St. Norbert College and St. Scholastica will look to continue their winning ways as they play each other in two weeks.